It’s a sad day for nestcam watchers, as a Bald Eagle nonchalantly snatched one of Rachel and Steve’s Osprey fledglings. But thankfully, there’s other bird news that’s more positive. Listen up, listers: If you’ve got an Iceland list, you might need to amend it … the country has gained six new nesting species in the 21st century. Answers may be on the way for the devastating beak-deforming condition known as Avian Keratin Disorder—scientists think they’ve identified the virus behind the problem. A new study proposes an algorithm for how birds navigate thermals, suggesting strategies that glider pilots might use. No sleep til Brooklyn? 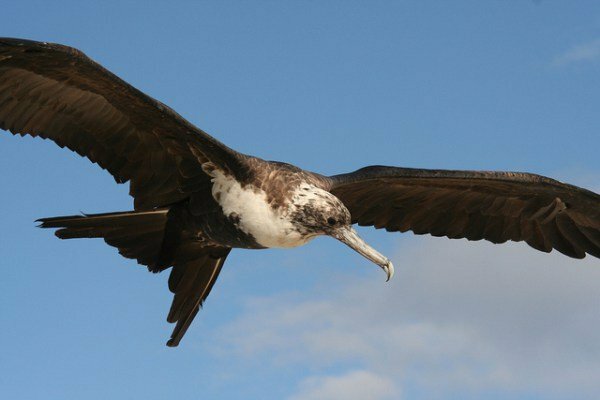 Maybe not, for Great Frigatebirds (such as the one Duncan photographed above), who appear to be able to conk out—partially or completely—and still maintain flight. Speaking of flight, you’ve never seen it like this before, thanks to the magic of chronophotography. And hearkening back to Corey’s penchant for diabolical quizzes, see if you can figure out how many Sandhill Cranes, Mallards, and Northern Pintails are in this maddening image … perhaps coming soon to a jigsaw puzzle near you.